It's 8:15 AM and just a few minutes remain until the school day starts. There is precious little time for Nick to copy materials before his first class begins. As he briskly walks into the teacher workroom, however, he is greeted by his old nemesis: The copy machine. Copy Machine: Hey man, how's it going? 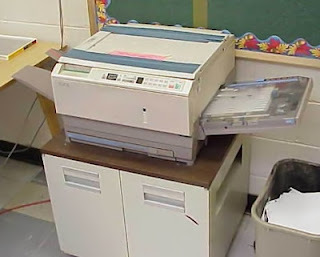 You going to make some copies before you start the day? Nick: Seriously dude, do not start this crap with me today. I just need to make some copies of my weekly update sheets and music theory quizzes for my students. Nick: I know what to do. <ALERT MESSAGE BEEP> PLEASE LOAD PAPER INTO TRAY 1. Copy Machine: Whoops. Looks like I'm out of paper. Nick storms off to get paper from the teacher work room and returns to load it into the copier. Nick: Okay, so now I'm really pressed for time. Can you please make these copies without screwing anything up? Copy Machine: Sure. Just load it it into the tray here and set up what you want...oh man, are you kidding me? Double sided AND stapled? It's not even first period yet! Nick: Just do your job. <ALERT MESSAGE BEEP> LOAD STAPLES ONTO STAPLE TRAY. Nick: HOLY CRAP! Are you serious?! Copy Machine: You'll never know since no one actually understands how (or attempts) to ever reload my staples. Nick: Why couldn't you have told me you were out of staples BEFORE I loaded you with paper? Copy Machine:Well, you're more than welcome to use one of the other machines in the building...but oh wait...I almost forgot....THEY'RE ALL OUT OF ORDER! Looks like you're stuck with me. Nick: Fine, I'll just staple them myself. Copy Machine: That's the spirit! Copy Machine: Alright, go ahead and load the paper. I'm ready to do this. Nick loads the originals into the machine and begins making copies. But after a few seconds, an unholy screeching sound is heard followed immediately by an error message. <ALERT MESSAGE BEEP> PAPER JAMS IN SECTION 1A, 1B, 3A, 5A, AND D4. FOLLOW THE GUIDANCE INSTRUCTIONS TO REMOVE JAMMED PAPER. Nick: NO!!! This not happening!! Nick angrily swings open the doors of the copy machine and begins digging out the jammed paper. Nick: You do this every time. EVERY. TIME. Why can't you just copy things without turning it into some sort of mind game with me?! Your behavior is completely sick and inappropriate. Copy Machine: ....says the man with his hands currently inside me. Nick: And there is NO PAPER JAM in section D4! Why are you lying?! Copy Machine: If I say there is a paper jam in D4, than there is a paper jam in D4. Reality is of little consequence to my daily operations. Nick: Please just stop with the error message, at least. At this point, I'm only fixing this "paper jam" so that I won't look like a jerk who leaves the machine broken for everyone else. There's no way I'll get my copies done in time for class, anyway. Copy Machine: Oh, that's alright. Just tell your students that you were unprepared to teach them that day because of an inanimate object that copies things. I'm sure their young and impressionable minds will completely associate this failure with me and not you. Nick: I really hate you, you know that? I'm going to class. I can't wait until the day you die. Copy Machine: Hey Nick...do you know why people call me Bob Marley? Copy Machine: Because I'm always jammin'. Please also feel free to leave a comment below. If you'd like to sing my praises or tell me how terrible I am more personally, I can also be found on Twitter.